"Contestant #15, what is your future ambition?" There I stood at the 2001 Miss Teen America Pageant in fright and excitement. "My name is Trisha and my ambition is to become a succesful fashion designer (with a big cheesy smile)!" It has been a life long dream of mine to be in the fashion industry. However, things did not go as planned. Hello lovelies! My name is Trisha and I'm blessed with 23 years of life. I am wife of the handsome AJ and a mother to two munchkins, Noah & Caleb. I am originally from South America but grew up in New York. I hold an A.S in Early Childhood Education (loooooooooong story). Currently I'm a stay at home mom. 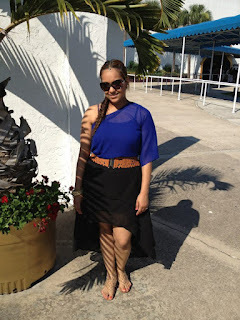 After long research and inspiration from blogger Dulce Candy, Maytedoll and many others, I've decided to create this blog to inspire females, whether in high school, college, a mother or just someone looking for an outfit idea. I've had so many family and friends who would always compliment my sense of style and ask, "where did you get that?" or say "I need to go shopping with you." Thanks to all of you who have inspired me and those who look to me for inspiration. In return I present you with this, my FASHION BLOG! I will be expressing my personal style along with a mix of celebrity outfit recreations. If you have any requests please feel free to contact me via email or comments. i'm one of ones that always look to you for what's new in fashion you can take anything put them together and makes it look fabulous.